I have a general disdain for coffee table books. They are what we from India call “time pass” books. These books are a combination of jaw-dropping factoids and fabulous visuals. Almost always, there’s little content of any significance in them. Often they are like teasers, or movie trailer. After browsing through a coffee table book, one often feels like getting a real book that will contain more substance. I prefer not to buy such books because they’re frightfully expensive. I made an exception today. 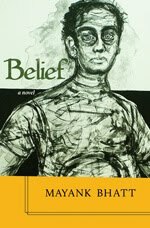 I went to Indigo (oh, these big book stores, how they manipulate you at a subconscious level) at Yorkdale mall with Che. He wanted to buy the sixth book in the 39 Clues series. 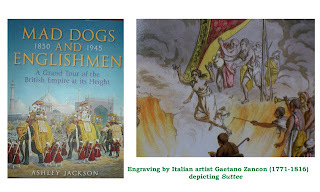 While there, I saw Mad Dogs and Englishmen A Grand Tour of the British Empire at its Height 1850-1945 by Ashley Jackson. I flipped through a few pages. It was a gorgeously illustrated book. I stopped at a page that had an engraving by an Italian artist Gaetano Zancon (1771-1816) depicting sati (or suttee, which is the colonial spelling). During the last year at Sheridan, I’ve participated in many spirited debates on post-colonialism, Orientalism and the importance of moving away from the discourse of the dominant in history. In today’s West where multiculturalism is the governing ethos, everyone but the most rabid supporters (Niall Ferguson, perhaps?) would see the British Empire as anything but an embarrassment. For proof, see the coverage of the 11-day Canada visit of Prince Charles and Camilla, Duchess of Cornwall, in the media. The Toronto Star's coverage appears inspired by Diana’s ghost. A Reuters report says many Canadians feel the Royal family is no longer relevant to them. History has moved away from the direction that Winston Churchill wanted it to go. For instance, in today’s world not many would share Churchill’s abhorrence for the Mahatma. On the contrary, many would find Churchill's views detestable. He was appalled to see the Mahatma draped in little more than a loincloth holding talks with the British Viceroy. However, at another – perhaps more fundamental – level, the British Raj did manage to force a revolution in India in the 19th century – in the sphere of social reforms in Hinduism. The British abolished Sati in 1829. This direct intervention into Hindu customs by “outsiders” led to the hastening of the social reform movement among Hindus in the 19th century. Of course, the orthodox elements continued to hold dearly on to their outmoded customs. They continued to oppose interventions in the Hindu customs by the new colonial rulers. Reading General Charles Napier’s quote in the book reminded me of another one by Sir Andrew Scolbe. Sir Scolbe introduced the Age of Consent Bill in 1891, which raised the marriageable age for girls from 10 to 12. The orthodox Hindus, led by Lokmanya Tilak, vehemently opposed the Bill. Tilak apparently was not opposed to the content of the bill. He was intolerant of the British, and was unwilling to let them abrogate the right to decide. The controversy flared uncontrollably. However, the Bill was passed. Sir Scolbe got all the support he needed from the likes of MG Ranade and Gopal Krishna Gokhale, among many others. A politically wounded Tilak, isolated in Pune, decided that the best manner in which he could recapture his position was to do something dramatic. He did. He launched the Sarvajanik Ganeshotsav (the Ganapati festival). Oh, yes. I bought the book. More about it this month.